We are still accepting applications for Grades 6-8. For all other grades, please contact the Admissions Office for information. We are no longer accepting international student applications. Please review the Admissions Checklist below to be sure all pieces of the application are completed. For any questions, please contact Michele Duncan, Admissions Director, (408) 481-9900 x4222. Click on this link, or the red button above, to complete Step 1 of the application process. Please contact Admissions@tka.org or 408-481-9900, Ext. 4222 for more information. Once you’ve completed Application Step 1, you will receive an email with instruction on setting up your personal admissions portal account. This portal will be used to complete and track your application. If you did not receive this email, please contact Help.Desk@tka.org. Log into your Admissions Portal to complete all application documents. Refer to the checklist below for all documents required. If you are unable to upload any of the required documents, you may mail or fax to the Admissions Office directly. You may also use the portal to check the status of your application. All prospective students applying for grades 6-12 are required to take the Secondary School Admissions Test (SSAT). 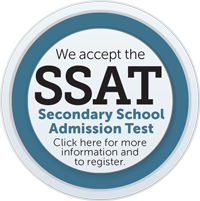 Please contact the Admissions Office to schedule your SSAT: (408) 481-9900 x4248. IMPORTANT: Score Reporting: In order for The King's Academy to receive your student's test scores, you must specify The King's Academy as the "score recipient" when registering with SSAT. If The King's Academy is not specified, we will not receive scores for your student. Testing Accommodations - If your student has a diagnosed Learning Differnece and will require testing accommodations, you must apply for those accommodations when registering for the SSAT. Accommodations must be approved in advance by SSAT. Qualifying applicants will be scheduled for an interview. After the admissions exam has been scored and all documents have been received, qualifying students will be scheduled for an interview. The applicant and both parent(s) or guardian(s) are expected for the interview. The interview is a time for us to learn more about your family and for you to gain a better understanding of The King’s Academy. Interviews will not be scheduled until all application paperwork has been submitted. Following the interview, our Admissions Committee will meet to consider all applications. Students will be notified by mail of the Admissions Committee decision in mid-March. Admissions decisions will also be posted in your Admissions Portal. (Admissions Portal Link). Students who are accepted to The King’s Academy will be required to take a math placement exam on Saturday, May 11, 2019 at 10:00 a.m. The student’s score on this test will determine their math placement for the 2019-2020 school year. Students entering in 9th-12th grades are required to take an English Honors & English AP Placement test if they are interested in being considered for placement in an English Honors or AP course. The items listed below must be completed and submitted before the Admissions Committee will proceed with the interview. Pastoral Reference OR Parent/Guardian Written Statement: If you are unable to provide a Pastoral reference please use the Parent/Guardian Written Statement form to explain why you are seeking a Christian education for your child. For more information, please go to the International Student Admissions webpage. The King's Academy has a non-discriminatory racial policy and admits students of all races to all the rights, privileges, programs and activities made available to all regularly enrolled students.